We just got back from our Las Vegas trip Tuesday morning so of course I had to let all know about the must sees and dos when visiting the strip! We stayed at the Paris Hotel for a few nights to really experience the strip and walk around! The hotel was amazing so chic inside, crystal chandeliers everywhere and just an overall Paris vibe of course. The pool over looked the Eiffel Tower of the hotel and was an absolutely stunning view while laying out by the water. Let's talk food! So as soon as we got off the plane at LAX we headed straight to In-N-Out for the first time EVER on our way to Las Vegas. Ya'll it was everything I imagined and when you've been on a plane for hours and starving it tastes extra good! Another fun spot we checked out was Taco Bell Cantina, yes the food you can get anywhere but not the drinks they have 7 different slushy flavors in which you can add a shot of alcohol and have the perfect drink to beat the heat! To top it off we had to stop and get Fat Tuesdays because when in Vegas! Some must do activities would include visiting old Vegas, Fremont St. and seeing everything there. Also if you are adventurous check out the High Roller Ferris Wheel the view is amazing and it is a perfect way to see the city! Of course if you have time check out a show they have tons to offer and tons of amazing singers have residencies in Vegas currently! Lastly if you have time on your way out of Las Vegas make sure to stop at the Seven Magic Mountains! It is so cool and different, definitely a must to stop and take some photos with these colorful rocks! Do expect it to be packed I would highly suggest maybe getting there earlier in the morning to beat the crowd but again totally recommend it! Have you ever been to Las Vegas? Let me know in the comments below we are thinking about going again sometime and exploring more! Summer is on its way here in the sunshine state! 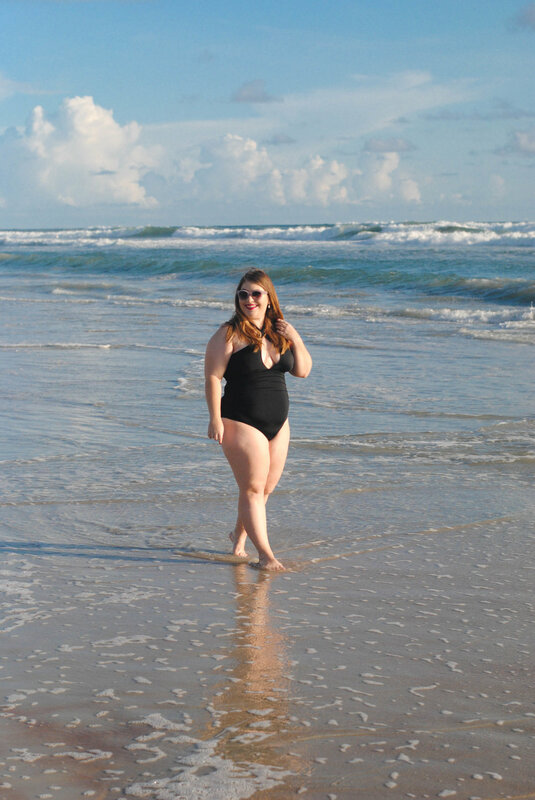 We have already made a few local beach trips to New Smyrna Beach our go to beach here in Orlando. If you have never been it's an awesome drive on beach making it the most convenient to pack lunch and drinks and have a day at the beach without lugging your stuff from the car to the beach, perfection! Saturday was perfect beach weather and so beautiful! We of course went with our friends and had an amazing time and of course snapped some photos as well! The beach is my favorite place, the best place to take a minute and reset! I was born and raised in Florida and could never imagine not living remotely close to a beach! What about you? Love the beach or no? Again all my pieces are linked below. 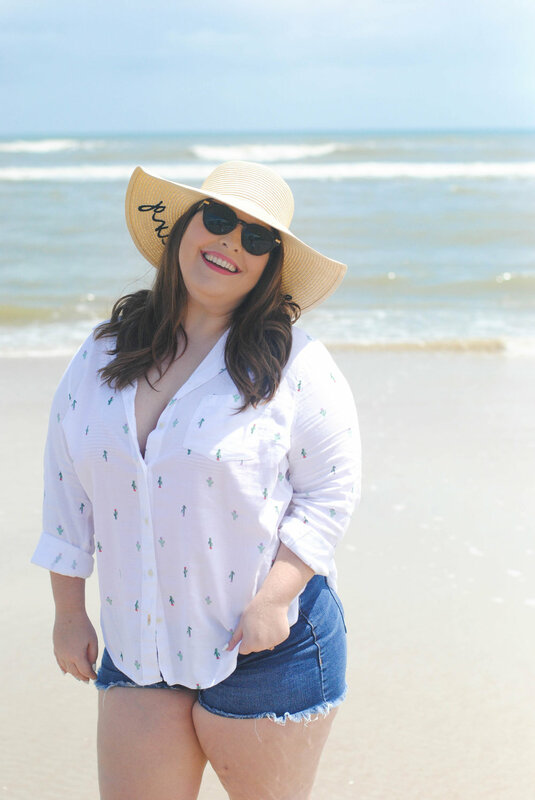 Everything is super affordable, the suit is actually from TJ Maxx and the top and shorts are Old Navy and the hat is my favorite LC by Lauren Conrad for Kohls, make sure to check them out! Happy Thursday everyone! I wanted to sit down and talk travel essentials for a few minutes. I have several trips planned for this year and am working on booking more trips and have quickly learned that we all have our basic things we bring on every trip. That being said I have 7 travel essentials besides basic necessities that I take with me on every trip I go on and they really have come in handy recently with all our traveling. Check out my top 7 travel essentials below and let me know your must haves when traveling! 1. Of course first things first is my suitcase. I recently invested in a hard shell suitcase from iFLY that is super cute but also heavy duty. I love how easy it is to pack and how much it holds. I only travel with a carry on suitcase as it saves time and money when traveling as well! I've linked my suitcase below as well as a few others I love! 2. Next thing is a toiletry bag. I'm obsessed with my Genoa Voyager Toiletry Bag from Hudson + Bleeker. This bag is perfect for traveling whether just escaping for the weekend or leaving on a 2 week excursion you will want this bag with you. I'm nortorious for packing several different bags for different things and this keeps it simple. I pack this bag for toiletries and another for makeup that's it. Find my bag linked below along with a few others that I adore! 3. Makeup is my kryptonite and I can't travel without it, needless to say I need a bag that can take it. My friend Mer got me my current makeup bag that I adore for traveling as it has a seperate area for brushes and is durable and easy to clean. It's the perfect size and highly recommend having a makeup bag like it that can withstand the travel. Again I've linked my bag below along with other recommendations. 4. Of course you need your travel sized toiletries for your trip. I always have my shampoo, conditioner, face wash, perfume, and micellar water. I pick up all my travel sized toiletries at Ulta and Target. Below are some of my favorites that I take everywhere with me. 5. Every time I travel I always make sure to have a sweater, doesn't matter if I'm going to the hottest destination or not I always have a sweater for the plane or if you happen to get chilly out to dinner or something. My must have cardigan is from White House Black Market, below are some other favorites too. 6. Up next I always travel with flats, or whatever is your most comfortable walking shoe because let's be honest you don't want to be stuck without comfy shoes. Never travel without shoes that you can live in because when you travel you never know what you'll be doing. Again some favorites linked below. 7. Final must have for travel besides the absolute necessities is a basic T-shirt and some jeans because you can't go wrong with that outfit. Casual and comfortable is the absolute way to travel. My go to as you all know is Old Navy and Loft for my casual looks check out some must haves below. Hope you all enjoyed this post, please let me know your travel must haves in the comments below! Happy New Year everyone! Hope you all have had a great start to the new year and have set some goals for 2018! One of my goals this year is to travel more and have started fulfilling this goal already with our first trip of the year to Vero Beach. 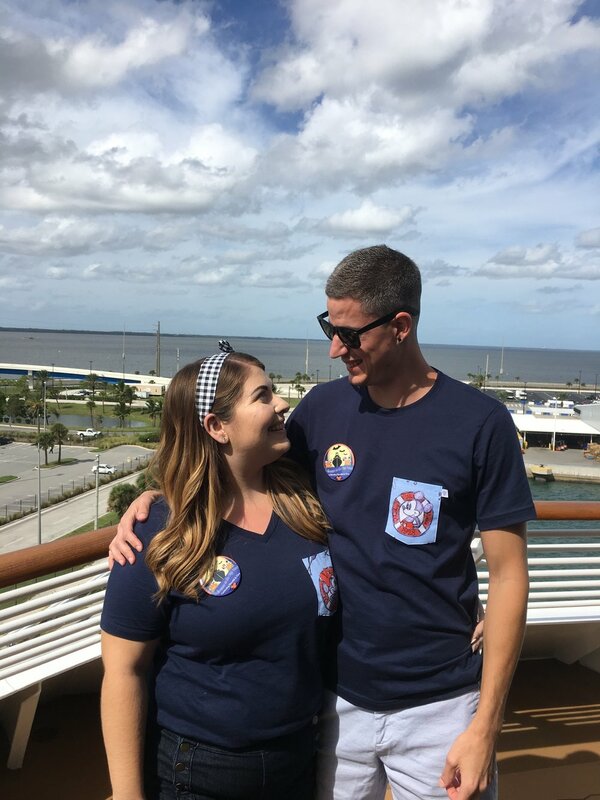 We spent this past weekend celebrating our close friends' Mer's birthday at Disney's Vero Beach Resort! What a stunning place to start off the new year! The decor around the whole hotel was stunning so nautical and clean, giving me perfect beach vibes! Although it's still pretty chilly here in FL we still hit the beach for a few minutes...in jeans...before dinner LOL! Never the less we still had a blast hanging out with our friends and venturing to a new place! Below you can find some of my looks from the weekend! Hope you all enjoy! Where are you traveling this year? Let me know! Saturday during the day we played some mini golf and corn hole so of course it was a jeans and t-shirt kind of day. I kept it tropical with the lime green T and royal blue earrings since we were at the beach after all. Saturday night we grabbed a few quick photos on the beach before heading out to dinner. Yes, it was so cold hence the jeans and sweater but you can't vacation at the beach and not go to the beach right? Sunday before heading home we enjoyed some sunshine and the beautiful resort! Literally such a stunning place! First stop on this trip was an authentic Mexican restaurant for Cinco de Mayo of course! We went to Monarca's Mexican on St. Pete Beach. The food was amazing, definitely give them a try if you are in the area and love authentic Mexican food! I of course was dressed very festive with my bright colors and statement necklace! Next stop on our trip was of course Clearwater Beach! If you have never been to FL I suggest vacationing on the west side of the state, the beaches are the best, no really they have been voted the best and the vibes are amazing! Can you tell I love my home?! Haha! Anyway we saw an awesome sandcastle, grabbed some grub and had a blast having a beach day! Surfside Taphouse had amazing food and great prices for being right on the beach and the atmosphere was great as well, definitly a must! That night we went out to another great restaurant called Gators Cafe & Saloon, which is right on the water in Treasure Island, FL. Another great spot, unique to the area, with live music and a really fun atmosphere as well! 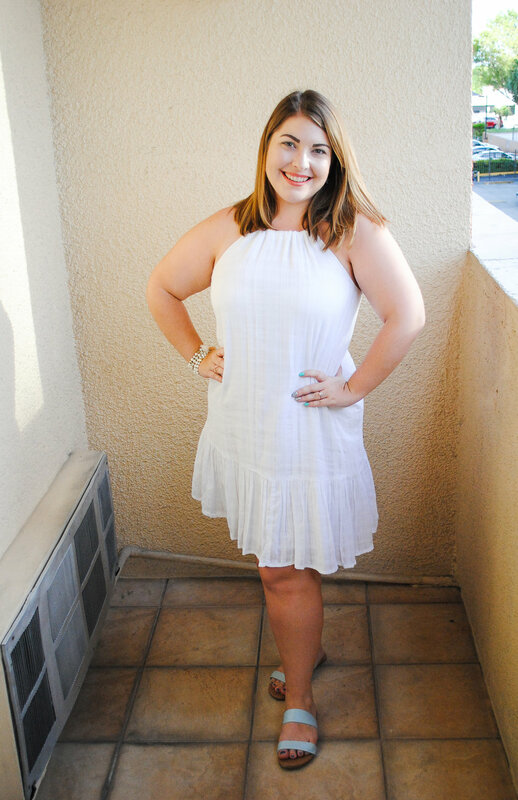 Didn't get any photos that night as we went out to eat pretty late, but flat lay and details are below :) This was probably my favorite outfit from the trip, super comfortable and beachy yet put together all at the same time! Finally on Sunday we went out to brunch at Lodge in Tampa, and the food was A-Mazing! We went to the Soho area in Tampa which is super cute and full of yummy places to eat and cute shops and beautiful apartments! Such a stunning snippet of Tampa to visit on our way home! Below is my casual Sunday Brunch outfit, I've been super into this color combo lately, perfect for spring and summer!